Upcoming Reading in Long Branch, NJ! 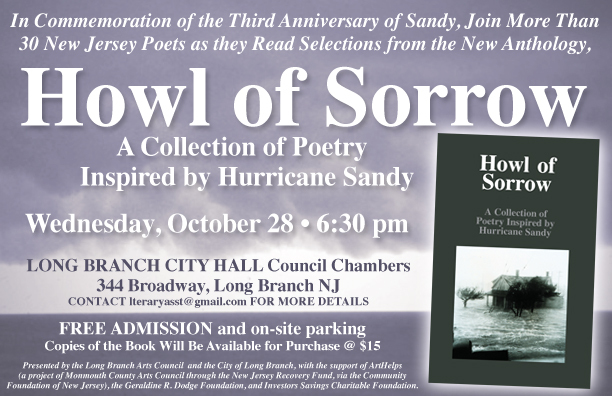 I’ll be joining a bunch of other talented local poets to read from Howl of Sorrow. It’s a collection inspired by Hurricane Sandy and the impact it had on the Jersey Shore. If you’re around, or would like to come out, I’d love to see you there! I have two poems in this collection and will presumably be reading both. Given the nature of this anthology, I’ll sign whatever you want for free–including other anthologies, should you pick up something else I’m featured in and bring it along. Check the tabs above to see what else I’ve been up to (but I have to update those pages, so they don’t include everything).